After a hot and humid summer, it was nice to finally have a Thursday forecast that was clear and with a high below 80. 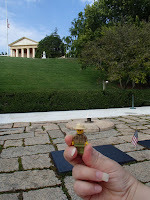 We mainly had been waiting for a Thursday to go with Dad to get the rest of the NPS Centennial stamps on the National Mall, but we decided to also finally do Arlington House since we decided to take the metro to Arlington Cemetery and walk down the mall from that end. The hill at Arlington Cemetery makes it quite a trek to get to the various sites, especially with Arlington House being at the top. 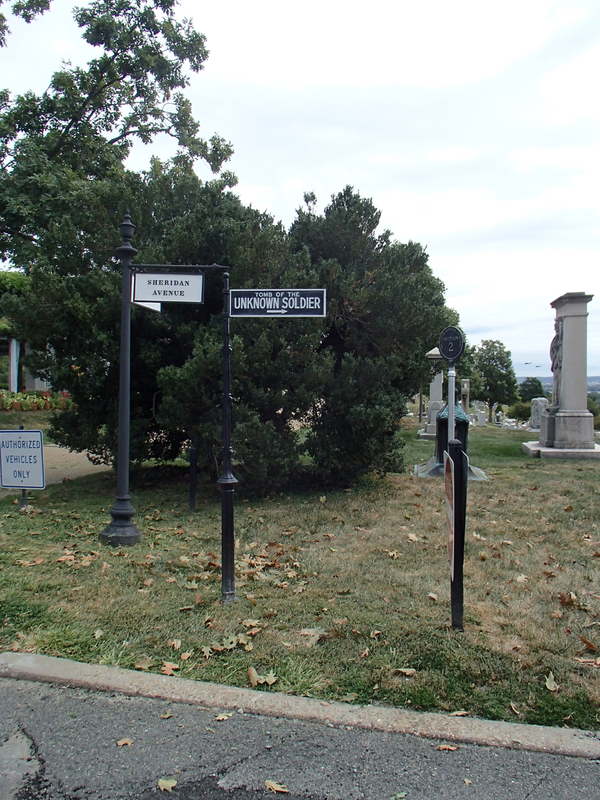 The real annoying part, though, is the signage at Arlington Cemetery is horrible. 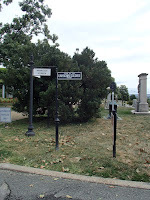 It does have signs to the Kennedy gravesite and to the Tomb of the Unknown, but no where does it point which roads to take to get to Arlington House. 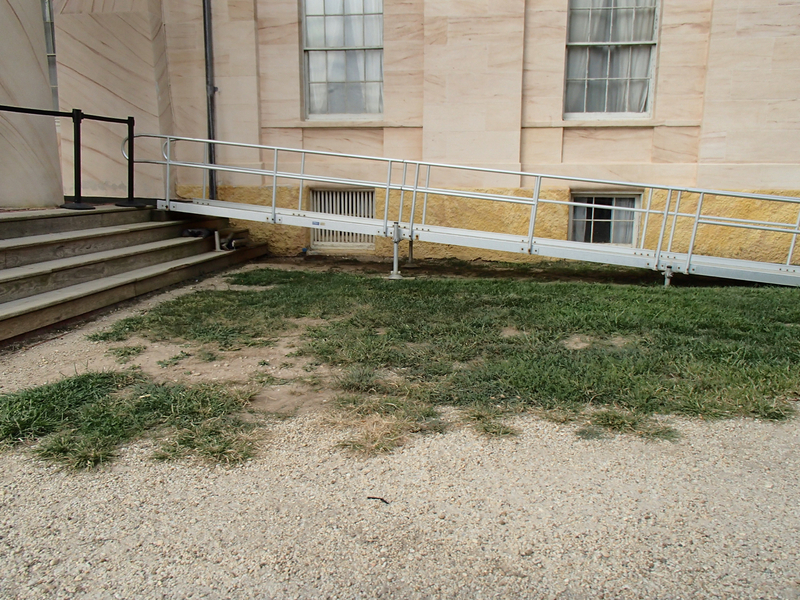 Also, depending on where you are at the signs to the Tomb of the Unknown are pointing to the inaccessible stepped Crook Walk to it. Luckily, Dad had grabbed a map and we were able to figure out the most direct way to Arlington House (Mik wasn't up for the extra time to trek to the Tomb of the Unknown). 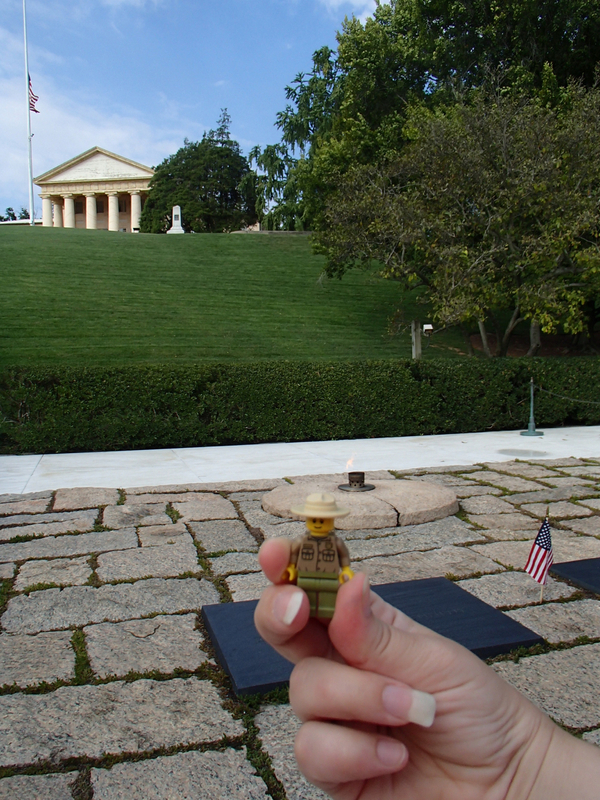 On the way to Arlington House, we stopped at the Kennedy gravesite. The stepped path up to the eternal flame is still not ideal and it is annoying that there is no ramp to get to the other part of the memorial, but at least it wasn't raining like last time we visited, so it wasn't slippery. 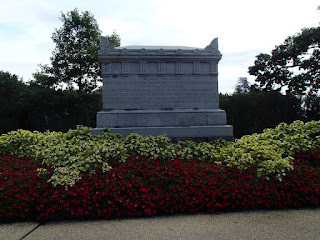 We also checked out the Civil War Unknown Monument, which was on the path we discovered we needed to take to be able to get up to the Arlington House as the more obvious direct path is steps by the tour bus stop. 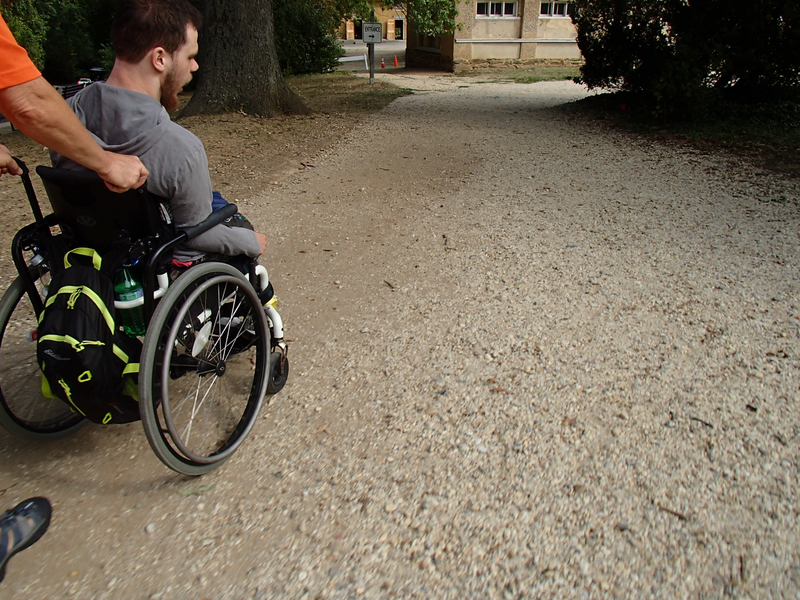 The paths around Arlington House and the other buildings are dirt/gravel, which Mik didn't particularly like, but for the most part they were packed down enough to be easy enough to push him through. 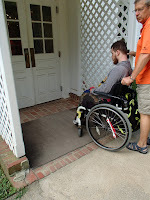 To visit the house there is a ramp up to the porch. 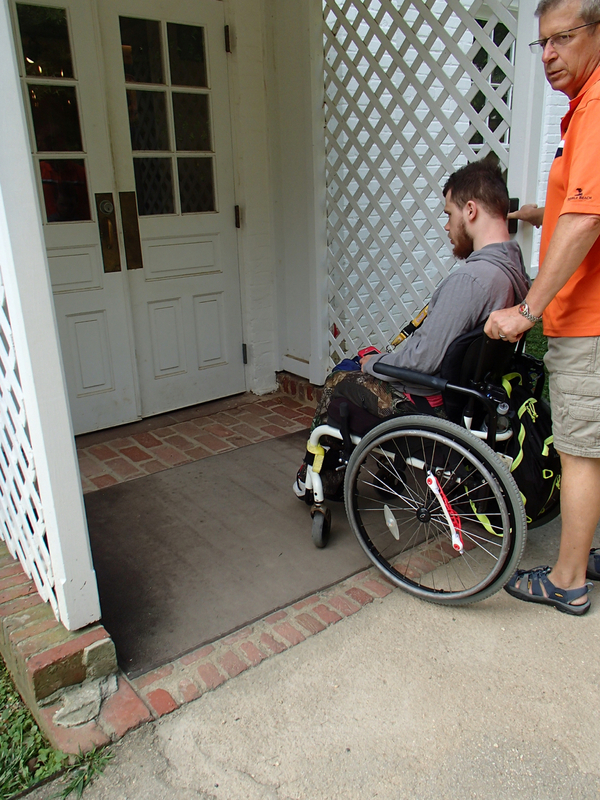 The ramp up to the front door is a little awkward. Dad asked me to hold it open and I'm glad I noticed it had a stopper you could put down to hold it open because there really isn't room to stand to hold it open without getting run over. 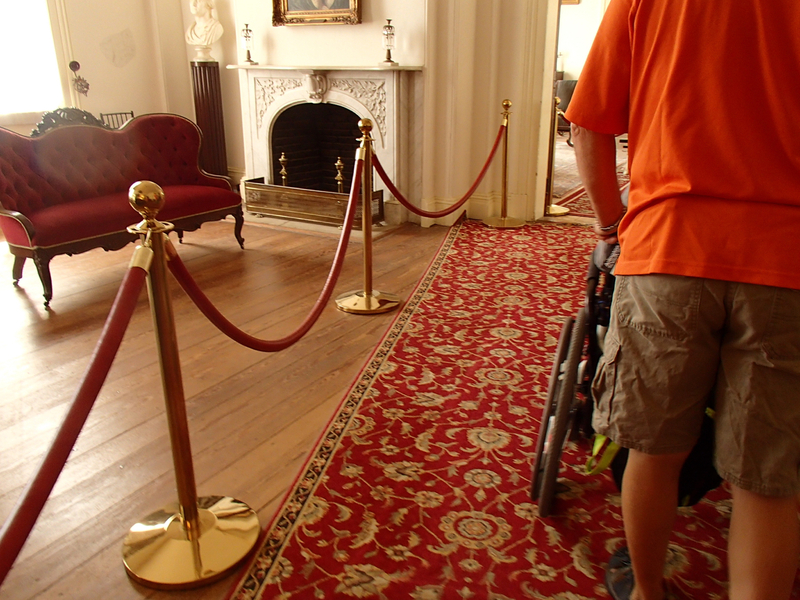 The house is a self-guided tour and there are no signs to give any information (at least not on the first floor), but there is a ranger that you could ask for information. On the first floor there are three rooms to see and then you end up at the conservatory, which has steps down to it, so we turned around and went back out the way we came in. I think there is also a second floor and basement to tour, but since Mik couldn't access them, none of us visited them. On the grounds, there is two slave quarters buildings, a flower garden, a kitchen garden, and a museum. 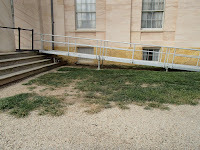 The slave quarters buildings and the museum are all level with the path making them more accessible to enjoy. The slave quarters buildings just have the doors open. The museum has an automatic door button, although it wasn't working. The museum is small, but it provides a good timeline of Robert E. Lee's life and a little on the Custis family. 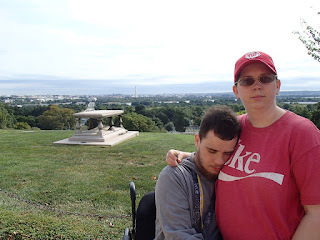 Our favorite part of Arlington House was L'Enfant's grave and the view overlooking D.C.